The right serving ware is more than practical, it enhances the aesthetic appeal of any food display. Serving bowls, platters, chafers and organizers are available in a plethora of sizes, styles, and finishes to help you put together the perfect buffet table. Serving bowls come in a variety of sizes and materials, some perfect for serving dip at a table, others large enough to hold salad for a hundred. Whether it’s chilled fruit in a stainless steel bowl or warm potatoes in a ceramic dish, you can be sure to find the right piece to compliment your food and décor. Chafing dishes come in a wide range of sizes and styles. Smaller dishes are ideal for rolls and sauces, while large ones are perfect for serving meat, scrambled eggs, and casseroles. Keeping food at the right temperature over long periods is essential for food safety as well as taste and visual appeal. Available with lift off lids, hinged lids, and roll-tops, choose from a practical economy chafer or a high-end statement piece that really spotlights the food. Buffets and catered event go better with the right chafers on the table. Ketchup, mustard, relish, onions and more can be clean, organized, and easy to get to with these condiment holders. Whether it’s the Fixin’s station at a cafeteria, convenience store, or buffet, we’ve got what you need to keep it orderly and stocked. Keep condiments & supplies organized and accessible for diners at buffets and self-serve stations. Napkins, flatware, straws, and condiment packets are at your guest’s fingertips with these convenient organizers. Whether you need 2 bins or 20, there is an organizer just right for your needs. Keep salad bars in tip-top shape with pieces that make it easy. Crocks are great for salad dressing, cheese and croutons, and the right size ladle means less waste of dressings and sauces. Long handle tongs make it easy for guests to select only the items they want on their plate and leave the rest for the next person. A countertop cup dispenser makes it easy for guest to choose their cup size and beverage of choice. Designed to hold cups, lids, and straws, these pieces are key to any self-serve area in convenience stores, fast food restaurants, and cafeterias. For just a few or a few hundred, there’s a cup dispenser to suit any application. When you need butane for a cooking torch, lamp fuel for candle lamps, or chafing dish fuel, we’ve got what you want. Available in a variety of fuel times, so you can be sure to make it through to the end of service without having to replace fuel cells. Change to Food Display Covers – Clear display covers allow you to display finger foods, bakery items, sliced fruit and more while keeping food protected and fresh. In an office, catered event, or buffet, being able to safely display food options is key to successful service. Stainless steel water pitchers, dessert dishes, creamers, gravy boats, coffee dispensers and serving trays can be beautiful as well as useful on your buffet table. Ideal for banquet halls and country clubs, choose from a wide range of serving pieces to complete your food service display. Keep napkins accessible for guests. A busy fast food restaurant, convenience store, or deli needs to provide an ample supply of napkins for their customers. 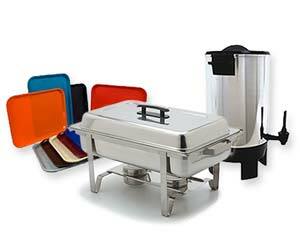 Choose from a high capacity gravity feed dispenser, a large full-fold napkin dispenser, or a modest tallfold napkin dispenser; in plastic or stainless steel. Tray stands are available in a variety of styles to compliment any restaurant décor. Provide servers with quality tray stands to ensure proper delivery of food, and convenient removal of dishes. Trays are used to display and serve food in a variety of food service environments. From decorative trays for passed hors d’oeuvres at a party, to plastic fast food trays in the food court, to the classic round beverage tray at your favorite pub, there is a tray to fit your needs. Available in a variety of colors and sizes for any application. Whether on a tabletop or in a bucket stand beside the table, these attractive wine coolers and wine buckets allow you to serve wine and champagne to your customers in style. Choose from a clear plastic design or metallic finish to best suit your décor and service needs.